The objectives of this study were to analyze the specific cytomorphological features of lung adenocarcinoma that harbored the ALK gene rearrangement and to compare the morphological features with the mutation-negative cases. This was a retrospective case series conducted in the Department of Pathology of a tertiary care hospital. The study included 40 cases of NSCLC–adenocarcinoma subtype, which were diagnosed on histology with or without the aid of immunohistochemistry (IHC). IHC was performed on formalin-fixed paraffin-embedded (FFPE) tissue sections using the standard protocol for napsin, p40, and thyroid transcription factor 1. After the diagnosis was established, testing for ALK rearrangement was done using IHC with the Ventana anti-ALK (D5F3) clone. The FFPE tissue blocks were sectioned at 3–4 μm, using a microtome (Leica, Germany), mounted on tissue bond-coated slides (Biocare, USA). The immunostaining using the D5F3 antibody immunostaining was performed on the benchmark XT system using the Optiview DAB IHC detection kit and Optiview Amplification kit. The prediluted Ventana anti-ALK (D5F3) rabbit monoclonal primary antibody was used along with the rabbit monoclonal negative antibody in every case. A positive control (appendix) was run with all the batches. The staining was performed as per the manufacturer's instructions. Cytoplasmic and/or membranous staining was assessed. A sample was positive when there was presence of strong granular cytoplasmic staining in any percentage of tumor cells and negative when cytoplasmic staining was absent. 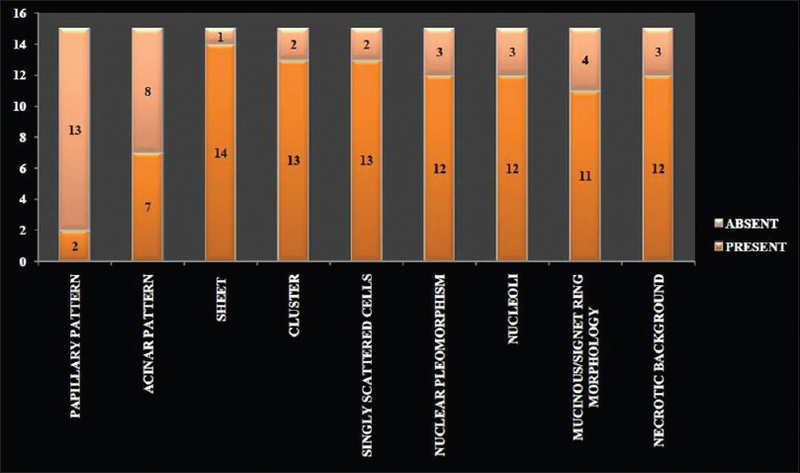 The study sample of 40 cases included 15 ALK-positive cases and 25 ALK-negative cases. The corresponding fine-needle aspiration cytology slides of all the 40 cases were retrieved from the records. The cytology smears retrieved were both air dried and wet-fixed smears that had been stained with May–Grünwald Giemsa, hematoxylin and eosin, and Papanicolaou stains are per the standard staining protocol. The cytomorphological features of all the 40 cases were analyzed using the following parameters: (1) cellular arrangement papillary, acinar, sheets, clusters, or singly scattered; (2) nuclear features – nuclear pleomorphism and presence/absence of nucleoli; (3) presence of mucinous features and signet ring morphology was assessed; and (4) necrotic background. A two-dimensional arrangement was “sheet.” “Cluster” was used to indicate a three-dimensional group of cells. Statistical analysis was performed using the IBM-Statistical Package for Social Sciences (SPSS, International Business Machines Corporation, New York, USA) analysis software, version 16. Chi-square test was used for the categorical variables. All P values were calculated with two-sided tests and P ≤ 0.05 was considered significant and highly significant when P ≤ 0.01. This was a retrospective case series that included a total of 40 cases (15 ALK positive and 25 ALK negative) of NSCLC-adenocarcinoma phenotype where testing for ALK protein expression was performed on the corresponding histology sample. The cytomorphological features of the ALK-positive versus ALK-negative cases were analyzed [Table 1]. Majority of the cases had a mixed pattern of cellular arrangement [Figure 1] and [Figure 2]. The most common pattern of cellular arrangement in the ALK-positive group was the sheet-like arrangement of cells present in 93.33% cases followed by clusters (86.67%) and singly scattered cells (86.67%). Papillary pattern of cellular arrangement was the most uncommon pattern and was present in only 13.33% cases. Amongst the ALK-negative group, the most common pattern of arrangement was clusters in 72% cases followed by sheet-like arrangement in 64% cases. Similar to the ALK-positive group, papillary pattern was the least common pattern in the ALK-negative group and was identified in 40% cases. A comparison of pattern between the ALK-positive and ALK-negative group revealed that the sheet-like pattern and singly scattered cells were more common in the ALK-positive group and was statistically significant with P value of 0.038 and 0.044, respectively. Moderate-to-severe nuclear pleomorphism was identified in 80% of ALK-positive cases and 72% of ALK-negative cases. Nucleolar prominence was identified in 80% of ALK-positive cases and 60% of ALK-negative cases. However, none of these criteria was statistically significant. This finding was present in 73.33% of ALK-positive cases, whereas only 24% of ALK-negative cases demonstrated either presence of mucinous features and/or signet ring morphology. This feature was statistically significant and the most striking feature of ALK-positive cases with P value of 0.002. The presence of necrosis in the background was identified in 80% of ALK-positive cases, whereas only 28% of ALK-negative cases demonstrated necrosis. This finding was statistically significant with P value of 0.001. In this current era of personalized medicine, the identification of genetic alterations is essential for targeted therapy. Predictive and prognostic marker testing is now mandatory in NSCLC-adenocarcinoma phenotype. The ALK gene rearrangement was first identified in the year 2007. The cases that harbor ALK gene rearrangement have distinct clinical and histomorphological features. ALK gene rearrangement is more commonly found in females and nonsmokers and at younger age. The characteristic histomorphological features include acinar, solid pattern with mucinous features, or signet ring morphology.,, However, there are very few studies published in literature, wherein the cytomorphologic features of ALK-rearranged lung adenocarcinoma have been evaluated. Cytological specimens represent a significant number of samples on which diagnoses of lung adenocarcinoma are rendered. Additionally, now cytology samples are being widely used for molecular marker testing, especially in cases where the disease presentation is at an advanced stage and obtaining a biopsy is difficult. In the present study, the most common pattern of cellular arrangement in the ALK-positive group is sheet-like pattern. This finding was statistically significant when compared with the ALK-negative group. In the study conducted by Li et al., the most common pattern observed in the ALK-positive group was the acinar or glandular pattern. In the current study, acinar pattern was present in 46.67% of ALK-positive cases. This finding is in concordance with the observations of Nishino et al. ; the authors stated that the acinar predominant morphology is significantly reduced in the ALK-positive group. In the study conducted by Ha et al., sheets were present in 93.8% and clusters were observed in 56.3% of ALK-positive cases. In the current study, clusters were observed as the most common pattern of arrangement in the ALK-negative group. In the study conducted by Pareja et al., the most common architectural pattern was papillary or micropapillary pattern. This finding is contradictory to the current study where papillary pattern was the least common and was present in only 13.33% of ALK-positive cases. In the current study, the ALK-positive cases displayed moderate-to-severe nuclear pleomorphism along with nucleolar prominence in 80% cases. This finding was not statistically significant when compared with the ALK-negative group. This finding is in concordance with the observations of Pareja et al. Li et al. stated that cases which harbored the epidermal growth factor receptor (EGFR) mutations that are the most common mutation in the NSCLC-adenocarcinoma phenotype were generally well-differentiated tumors with low-grade cytomorphology. The presence of higher nuclear grade in a tumor in cytology may indicate EGFR-negative profile and mandates consecutive testing for ALK rearrangement. The identification of subtle cytomorphological features that support the probability of ALK rearrangement is essential for therapeutics. The biopsy submitted for histopathological examination is at times insufficient for molecular testing. The procedure to obtain a lung biopsy is cumbersome and difficult. Hence, an attempt to morphological features supportive of ALK rearrangement may aid in more judicious use of the biopsy tissue. The current study is among the few studies from India, where a detailed analysis of the cytomorphological features of cases with ALK phenotype versus the mutation-negative cases has been performed. In cases that harbor the ALK rearrangement, the common pattern of arrangement is sheet-like associated with singly dispersed cells. These tumors are generally high grade with moderate-to-severe nuclear pleomorphism and presence of necrosis in the background. The identification of these cytomorphological features and patterns may aid in triaging cases that have the probability to harbor ALK phenotype, which further has predictive and prognostic implications. Travis WD, Brambilla E, Riely GJ. New pathologic classification of lung cancer: Relevance for clinical practice and clinical trials. J Clin Oncol 2013;31:992-1001. Thunnissen E, Bubendorf L, Dietel M, Elmberger G, Kerr K, Lopez-Rios F, et al. EML4-ALK testing in non-small cell carcinomas of the lung: A review with recommendations. Virchows Arch 2012;461:245-57. Kim H, Chung JH. Overview of clinicopathologic features of ALK-rearranged lung adenocarcinoma and current diagnostic testing for ALK rearrangement. Transl Lung Cancer Res 2015;4:149-55. Shaw AT, Engelman JA. ALK in lung cancer: Past, present and future. J Clin Oncol 2013;31:1-7. Desai SS, Shah AS, Prabhash K, Jambhekar NA. A year of anaplastic large cell kinase testing for lung carcinoma: Pathological and technical perspectives. Indian J Cancer 2013;50:80-6. Park HS, Lee JK, Kim DW. Immunohistochemical screening for anaplastic lymphoma kinase (ALK) rearrangement in advanced non small cell lung cancer patients. Lung Cancer 2012;77:288-92. Conklin CM, Craddock KJ, Have C, Laskin J, Couture C, Ionescu DN. Immunohistochemistry is a reliable screening tool for identification of ALK rearrangement in non small cell lung carcinoma and is antibody dependent. J Thoracic Oncol 2013;8:45-51. Yoshida A, Tsuta K, Nakamura H, Kohno T, Takahashi F, Asamura H, et al. Comprehensive histologic analysis of ALK-rearranged lung carcinomas. Am J Surg Pathol 2011;35:1226-34. Inamura K, Takeuchi K, Togashi Y, Hatano S, Ninomiya H, Motoi N, et al. EML4-ALK lung cancers are characterized by rare other mutations, a TTF-1 cell lineage, an acinar histology, and young onset. Mod Pathol 2009;22:508-15. Ha SY, Ahn J, Roh MS, Han J, Lee JJ, Lee B, et al. 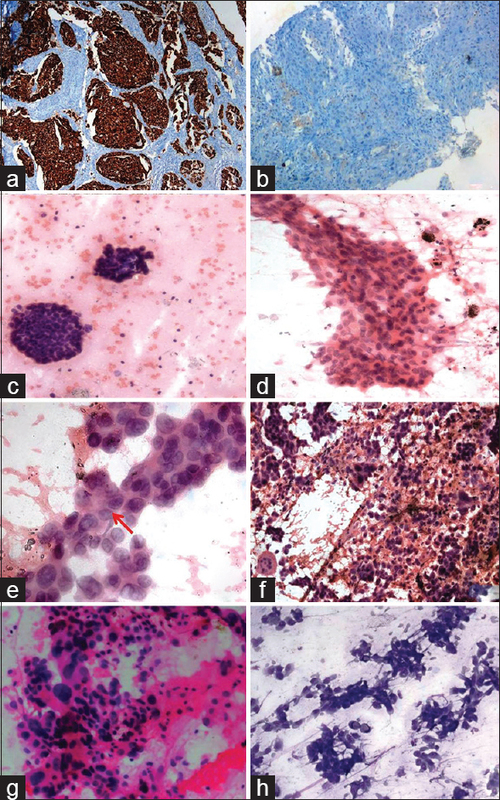 Cytologic features of ALK-positive pulmonary adenocarcinoma. Korean J Pathol 2013;47:252-7. Li Z, Dacic S, Pantanowitz L, Khalbuss WE, Nikiforova MN, Monaco SE. Correlation of cytomorphology and molecular findings in EGFR+, KRAS+, and ALK+ lung carcinomas. Am J Clin Pathol 2014;141:420-8. Nishino M, Klepeis VE, Yeap BY, Bergethon K, Morales-Oyarvide V, Dias-Santagata D, et al. Histologic and cytomorphologic features of ALK-rearranged lung adenocarcinomas. Mod Pathol 2012;25:1462-72. Pareja F, Crapanzano JP, Mansukhani MM, Bulman WA, Saqi A. Cytomorphological features of ALK-positive lung adenocarcinomas: Psammoma bodies and signet ring cells. Cancer Cytopathol 2015;123:162-70.